From its auspicious packaging of cute cartoon caricatures of animals, it’s easy to pass off Heart to Elk by Point Juncture, WA (who are really from Oregon) as another cutesy album made by indie rock kids that have a knack for writing songs that will be used as incidental music for future episodes of How I Met Your Mother, or quite possibly a Zooey Deschanel movie. And yet, for a time when many of the great indie pop bands are either going towards darker territory (Death Cab) or heavier and faster lands (Manchester Orchestra), Point Juncture’s posi-pop sound is a welcoming change. Through songs like “Once Tasted Ever Wanted,” “New Machine” and “Sick on Sugar,” the record is able to capture moods deftly on CD and play subtly on people’s heartstrings; it’s actually quite cathartic in its own right. 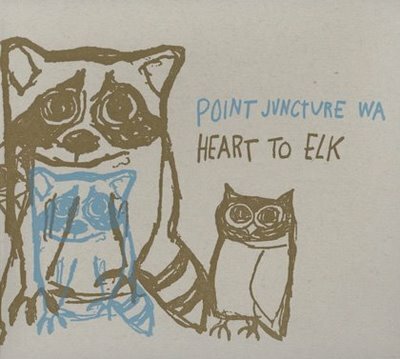 For all the posturing that pop rock bands have today (like DayGlo shirts with terrible designs and trying to add rapping to their vocal repertoire), a band like Point Juncture, WA is actually quite refreshing. They rely on solid songwriting and catchy melodies instead of cheap gimmicks and clothing sponsorships. They are, in essence, what a real band sounds like.